Cracklin’ Chicken has become a new favorite at our house. 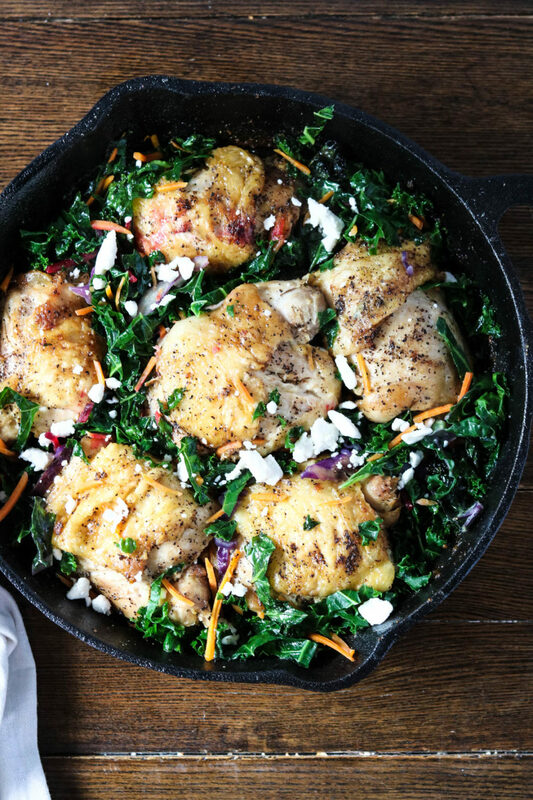 The key is cooking these chicken thighs (with skin) in a hot skillet with melted ghee. Oh. Em. Gee. For real, you’ll never eat your chicken any other way. And let’s talk about the braised greens. If you would have asked me a few years ago to eat braised greens I probably would have told you you’re crazy. It’s so funny how your taste buds change, especially when you remove crappy food from your diet. Braising these greens in the ghee at the end of the cooking process makes them so good! 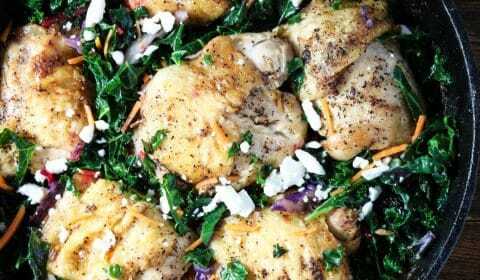 You can use spinach, or kale, or whatever green you prefer. 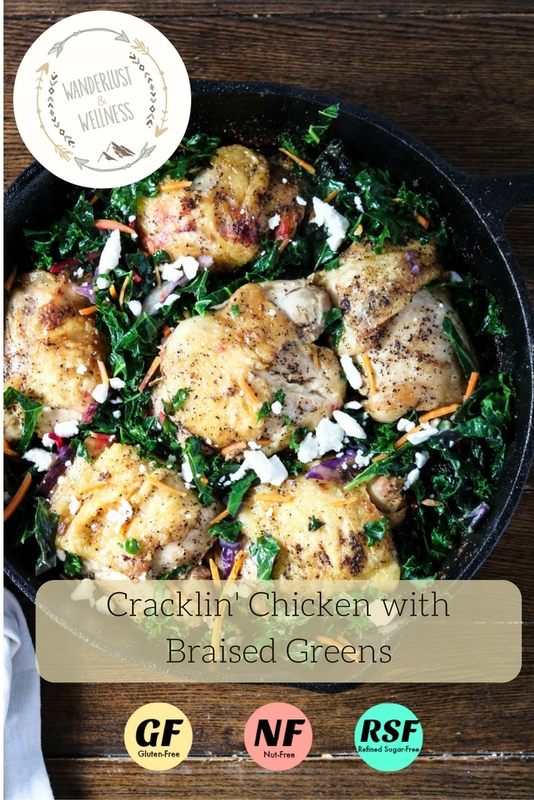 For this recipe I used a kale beet salad for the greens because I wanted a little extra vitamin ju ju with the beets and red cabbage. And you really don’t even need a lot of seasoning with this chicken. The ghee gives it so much flavor, I simply just salt and pepper the chicken with a sprinkle of garlic powder. I also add on a little goat feta cheese at the end but you can choose to leave that off. Sometimes I do, sometimes I don’t, depends on my mood. I probably fix this chicken almost weekly and the kids devour it! Now if I could just get them to eat the braised greens. Baby steps, right?!? Heat skillet (I used cast iron) over medium heat and add ghee. Once ghee is melted, add the chicken thighs and shake on salt and pepper. I don’t actually measure this out on this recipe, I just give each thigh a nice coating of both. Sprinkle on the pinch of garlic powder. Fry the chicken in the ghee, cooking approximately 3-4 minutes on each side before flipping. Keep flipping to prevent the skin from sticking to the pan and fry until cooked through. 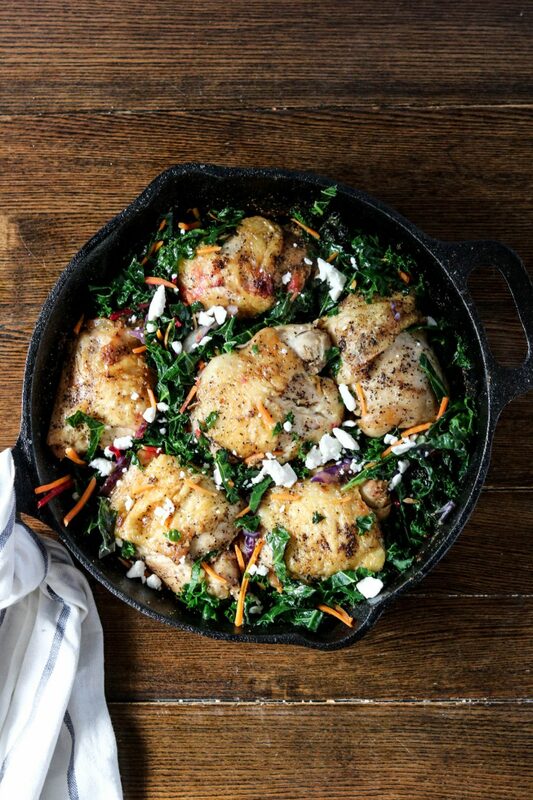 Remove chicken from skillet and add the greens to the liquid. Stir the greens until well coated and then cover the skillet with a lid and allow the greens to braise in the liquid. 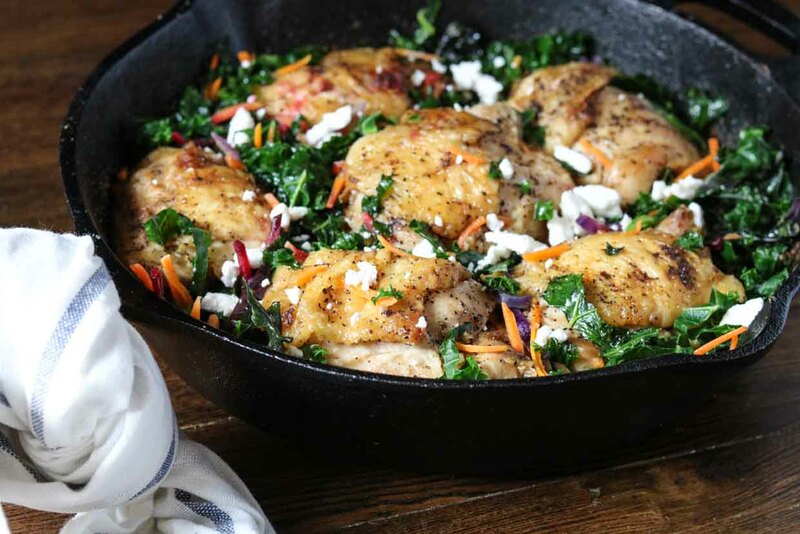 Once the greens are soft, add the chicken back into the skillet on top of the greens and sprinkle with goat feta cheese (if preferred).